Being from a species native to a low-gravity planet, it was extremely difficult for Melora Pazlar to function in "standard" gravity. As a result of this limitation, only a small number of her kind actually left the Elaysian homeworld to explore space. The limitation she experienced did not stop her, however, and she soon enlisted in Starfleet. Part of her reasoning for joining Starfleet was to encourage others and show them that she could overcome any adversity; however, she also had a strong desire to explore space and other worlds, instead of merely being confined to her planet. At some point in her life, she learned to speak Klingonese to a fluent level and developed an interest in Vulcan music such as etudes by Delvok. She also enjoyed Klingon food, preferring to see "the blood running through the veins" of her racht. During her studies at Starfleet Academy, Melora kept people at arm's length, believing other people would treat her differently because of her limited mobility in "normal" gravity. Her servo controls and anti-grav chair were needed for her to operate effectively at the Academy and she felt these distinguished her from the rest of the students. She eventually graduated as a stellar cartographer. By 2370, Melora had achieved the rank of ensign. Her first deep space assignment came in that year, when she was temporarily assigned to Deep Space 9, to survey a sector in the Gamma Quadrant. Upon her arrival at the space station, she requested permission from Commander Benjamin Sisko to conduct the survey alone, believing she could accomplish the task quicker and to a better standard than if somebody accompanied her. When Sisko refused, she treated it as evidence that he thought she was disabled in some way, though Sisko eventually made it clear that Starfleet policy did not allow anyone to go on a mission alone, especially not an ensign. Her stubbornness to do things by herself caused her to have an accident while attempting to obtain an astrophysics array for her mission. When entering the cargo bay, she tripped, landing on her servo controls. It was only after Lieutenant Dax found her that Melora was taken to the infirmary and her controls repaired. Subsequently, the mission to the Gamma Quadrant was delayed by a day, in order to give her time to recover. During Melora's time on the station, Doctor Bashir researched and further developed Nathaniel Teros' work on neuromuscular adaptation. If successful, the therapy would make it possible for a low-gravity species, such as Elaysians, to move in an Earth-like gravity by elevating the motor cortex neural output of the brain. Melora was initially ecstatic about the news that she may be able to function in "normal" gravity like the rest of the crew, but after her second treatment, disadvantages emerged; once the procedure was complete, it would be irreversible, and any exposure to low-gravity could seriously disrupt her nervous system. 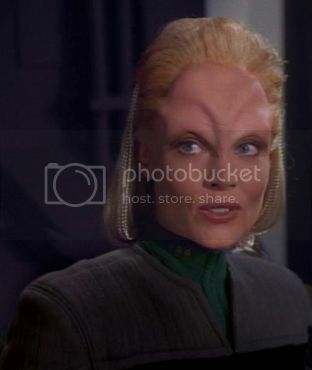 Melora decided she would take the time to think about the treatment, over the course of her mission in the Gamma Quadrant. Upon returning from that mission, she and Dax were ambushed by the criminal Fallit Kot and forced back into their runabout, the Orinoco. When Commander Sisko prevented their departure by means of a tractor beam, Kot shot Melora, forcing an overload in her servo controls and knocking her to the deck. The tractor beam was subsequently released and Melora, along with Quark and Dax, were taken through the wormhole. Commander Sisko, accompanied by Chief O'Brien and Doctor Bashir, quickly beamed to the runabout Rio Grande and initiated pursuit. On the Orinoco, an injured Melora lay on the floor as the ship accelerated to warp. Believing she was dead, Kot paid her no attention, thereby enabling Melora to reach the gravity controls by the transporter pad, where she disabled gravity on the runabout. While all of the Orinoco's inhabitants floated in the air, she kicked herself away from a console and into Kot, knocking him against the cockpit window and allowing Dax to gain control of the situation. The Rio Grande eventually caught up with them and Melora was taken back to the station. After having given some thought as to her neuromuscular treatments, Melora ultimately decided not to go ahead with them, believing it would strip her of what it meant to be an Elaysian. She was later reassigned to another position within Starfleet. During the Dominion War, Melora was decorated for valor after helping to save 192 of her shipmates. Melora took an extended leave from Starfleet and performed her peoples' atonement rituals, despite her worlds Exalted Ones finding her innocent of murder, her actions deemed unavoidable. Pazlar returned to Starfleet in the year 2379, serving briefly on the science-vessel USS Aegrippos before accepting Captain William T. Riker's offer to serve on the new Luna-class USS Titan as the head of stellar cartography department.